different, and I could start the Bronco by manually moving the ignition rod, so I new there was a problem inside the column. actuator rod, which made sense from what I had seen so far. 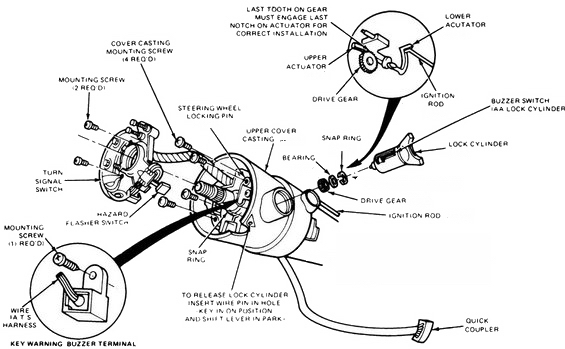 Below are detailed instructions on how to replace the broken lower ignition actuator. First, here are a few breakdown pictures so you get an idea of what is going on inside the column. Disconnect the battery and remove the steering wheel. Remove the access panel under the steering column. Remove the plastic housing at the bottom of the steering column. Remove the two screws (8mm and phillips) for the transmission indicator. Remove the two 9/16" bolts holding the column to the dash. the wiring harness running up the column. Raise the column and bolt it back to the dash. Turn the ignition cylinder to "on", press in the retaining pin and pull out the cylinder. Drive out the roll pin and remove the shift lever and rubber boot. Unscrew and remove the turn signal lever. both parts out. Remove the screw right below the steering wheel lock pin and pull out the retaining block. Undo the three screws and slide off the upper cover. The actuator was broken flush with the housing. I tried to pick at it but that drove it in more. out the other side, but it bottomed out. I drilled a small pilot hole in the actuator. Then used a pick to pry it out. I figured I could take it out this way. actuator was, it hits the upper tilt flange. Remove the two pivot pins. Thread a screw into the pin; when the pin starts to rotate, lightly pull it out. it turns out that you can press upwards on the tilt jaw and pull outwards to clear the pin. The replacement actuator. Ford #E9TZ-3E715-B. Help (aka Motormite) also sells these, #83280. New actuator with the old ignition rod. Put a light coat of grease on the new actuator and install. up the tilt flange and tap in the pivot pins. Carefully put the tilt spring in. Line up the upper part of the acutuator and slide on the upper cover. Put the retaining block back in and snug up the screw. Put on some loctite and thread in the three upper cover screws. Slide the signal switch on and tighten the two screws. 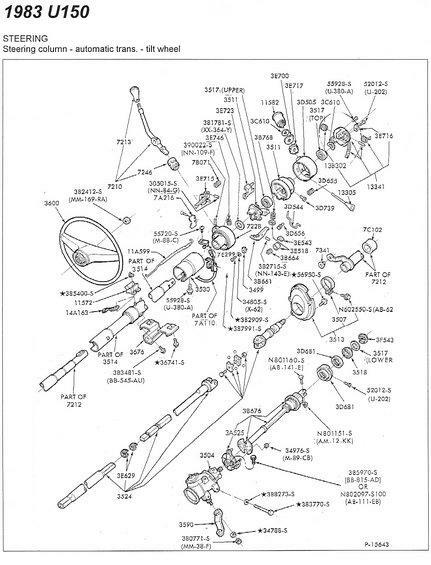 Re-install the transmission and signal lever's. cylinder as a reference as to what position the gear needs to be in. Slide in the bearing; it has a tab on it so it can only go one way. Drop in the snap ring. Slide the cylinder in and turn it to "off" to lock it into place. Attach the rod to the switch and snug up the two nuts. From here, reconnect the battery, align the igntion switch and cycle the ignition cylinder. Attach the two screws. Cycle the shifter and align the indicator on the dash. Put the cover back on and snug up the screw. Get the steering wheel on, double check that everything is tight, and you're all done!